More than 20,000 known ant species occur around the world, yet only 12,500 have so far been classified. 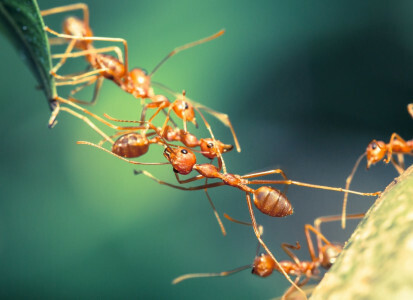 Ants can lift and carry many many times their own weight. In fact the tiny leafcutter ant (pictured at the top of the page) can lift and carry in its jaws something 50 times its own body weight of about 500mg. Army ants may prey on much larger animals such as reptiles, birds, or even small mammals. Ants represent 25 per cent or more of the animal biomass on the planet. All the ants on the planet weigh about as much as all the humans. Ants emerged along with flowering plants some 130 million years ago; by contrast, Homo, from which humans evolved, diverged only 2 million years ago. Ants communicate and cooperate by using chemicals (pheromones) that can alert others to danger or lead them to a promising food source. What are ant communities like? Ants are social insects which form colonies that range in size from a few dozen predatory individuals living in small natural cavities to highly organised colonies which may occupy large territories and consist of millions of individuals. Male ants often have only one role—mating with the queen. After they have performed this function, they may die.